At this time of year we've all been preparing for the holidays! Every day is filled with hustle & bustle. Grocery shopping and shopping for gifts, visiting friends, baking & rechecking travel plans, in addition to working is only a part of a busy week. Nutritious, tasty dinners that are easy to prepare are welcomed at the end of a busy day. 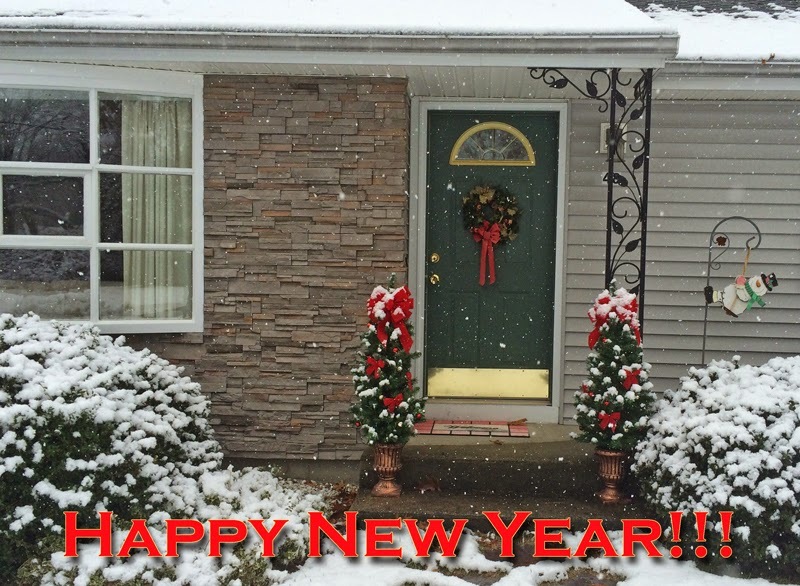 On this blog I've posted some yummy entrees that are found in the snowflake above. Many of the recipes are prepared in a Slow Cooker/ Crock Pot. Click on any entree in the snowflake & the post & recipe is at your fingertips. Sour Cream? Yes, I have Fat Free. Salt Free Butter? Yes, definitely need to use Butter! Rolling pin & rolling mat? Double yes. That's part of my check list before I bake Sour Cream Sugar Cookies. 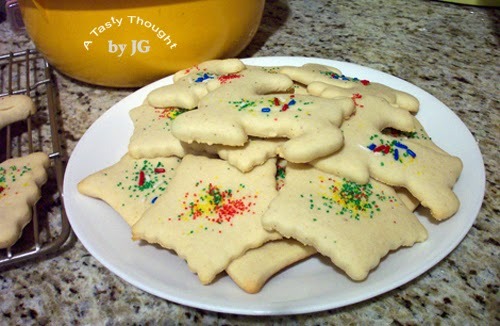 I've used my go to recipe for rolled out Christmas Sugar Cookies for so long - over 30 years. Imagine biting into a soft rolled out sugar cookie that has a cute whimsical shape. As you are chewing the cookie a hint of Nutmeg flavoring tastes so good. The sugar cookie is festive- decorated with colored sugars. After eating one, another is hard to resist! These cookies are time tested with both my family & my friends! They are made in 2 steps. On Day 1 the dough is prepared, wrapped & refrigerated to be used on Day 2. The next day take out the Colored Sugars, Rolling Pin & Rolling Mat. This is a very easy cookie to make/ bake. Roll the dough to 1/4". Then, use your cookie cutters. After baking/ cooling a taste test is definitely necessary. Who can resist this cookie? Usually I bake them 2- 3 weeks before Christmas & place them in the freezer. They freeze very well & are so yummy! In the next few days my cookie cutters & rolling pin will be put to work. I have the Fat Free Sour Cream & Unsalted Butter in my fridge. 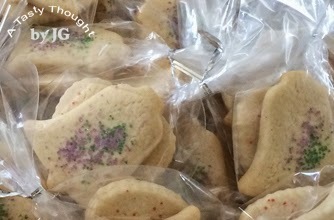 It's time to plan on making the dough & baking these soft yummy cookies. The bright yellow plastic canister that the Domino SUGAR was packaged in has been recycled! We have a new green toy for our grandsons! Over a 6 month period I've saved many different colored plastic bottle caps- red from apple cider, white from soy milk, blue (1% fat milk & O.J.) & yellow from apple juice. The washed bottle caps were stored in the cleaned canister. On Thanksgiving AM the Turkeys Table Runner (directions) was out & ready for business. ***Now that our younger grandson has passed the age/ stage of giving toys & books the taste test while admiring/ using, the bottle caps could make an appearance. With supervision this is a great toy. 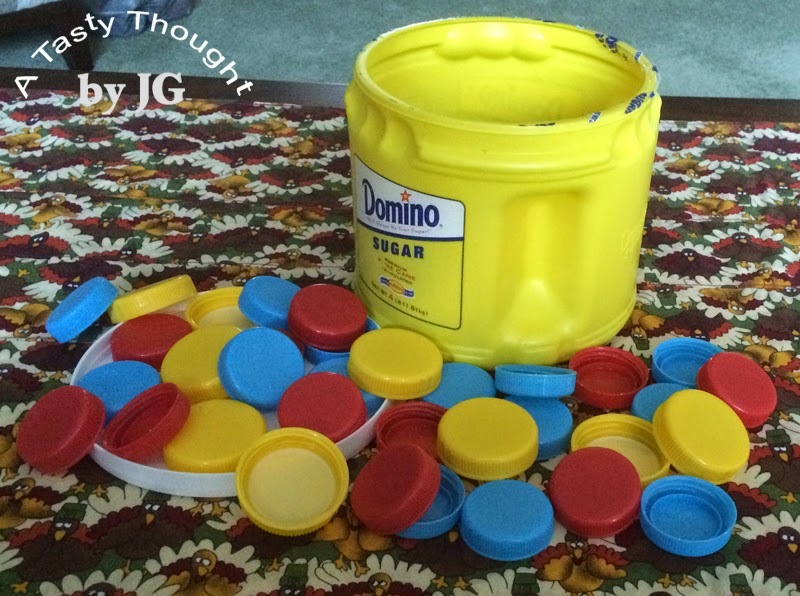 I had saved the plastic bottle caps to use as "counting objects". Once a teacher, always a teacher! Little did I know that Shake, Rattle & Roll is a much more fun use. The filled covered canister makes a great drum, too! Shaking, then opening the container & spilling the bottle caps is a FuN game. Then, collecting all of the caps while giggling adds to the enjoyment! Our new green toy is packed away to be used again! Maybe they will be "counting objects" in the future, but not for a long time! Who needs to count them??? I definitely need to change the table runner!